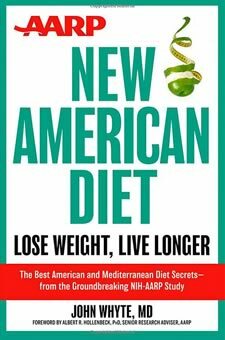 The AARP New American Diet: Lose Weight, Live Longer is based on the results of The AARP Diet and Health Study, which is the largest-ever survey of the diet and lifestyle of Americans. 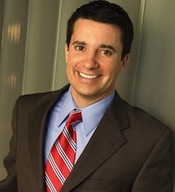 Author, John Whyte, MD is the Chief Medical Expert for the Discovery Channel. He offers a weight loss plan that can help you lose up to ten pounds in two weeks. The eating plan outlined in The AARP Diet combines aspects of the Mediterranean diet and the standard American diet. Readers are offered a 30-day meal plan to take away the guesswork and make the diet easy to follow. However, you are encouraged to eventually create a personalized plan within the guidelines of the program. Whyte debunks many diet myths while revealing information that may be surprising to some dieters. Some of the myths he addresses are…. Eating fat-free foods and consuming artificial sweeteners can actually make you gain weight. Foods high in fat – like unsalted nuts – are not only permitted but are an important component of a healthy diet. You can eat up to 4 eggs a week and maintain healthy cholesterol levels. The AARP Diet includes up-to-date recommendations for the ideal intake of sugar, fat, fiber, meat, and alcohol. You don’t have to eliminate any food groups if you want to lose weight. Rather you should eat a balanced diet consisting of fresh fruit and vegetables, whole grains, nuts, low-fat dairy, fish, and lean meat. To make things simple Whyte provides dieters with a list of practical things to pay attention to for losing weight. Oatmeal, whole wheat bread, high-fiber cereal, brown rice, whole-wheat pasta, low-fat milk, cottage cheese, plain Greek yogurt, salmon, tuna, shrimp, chicken breast, turkey, beef, eggs, black beans, berries, banana, apple, avocado, green beans, lettuce, asparagus, tomato, natural peanut butter, walnuts, almonds, pistachios, sunflower seeds, extra-virgin olive oil, dark chocolate, coffee. Whyte explains that nutrition accounts for 70 percent of the problem in people who are overweight. The remaining 30 percent is related to physical inactivity. You should aim for at least 30 minutes of vigorous exercise, three days a week. In particular walking is recommended to improve brain health. If you can walk seven miles a week you may have half the risk of developing dementia. AARP New American Diet: Lose Weight, Live Longer retails at $19.95. The AARP Diet does not require calorie counting. Allows a balanced intake of a variety of healthy foods. Encourages eating breakfast and healthy snacks, which reduces the tendency to overeat throughout the day. Promotes healthy eating rather than dieting to lose weight. Most of the information is not particularly new or groundbreaking. The first two weeks are fairly restrictive, as dieters are required to eliminate many foods and avoid eating in restaurants. Those who don’t like eating fish may not enjoy the meal plan. Dieters may struggle with rebound weight gain after the first 30 days. The recommendation of coffee as a health-promoting beverage is controversial. The AARP New American Diet is a guide to help you make better food and lifestyle choices. By following the recommendations in this book you can lose weight and experience vitality and health throughout your life. While the information in The AARP Diet is not especially unique, the information is presented in a practical and straightforward way. Thus this book will appeal to inexperienced dieters who want to learn about healthy eating for weight loss and disease prevention.